Black and white photography lends itself well to a lesson on COLOR VALUE. Point out contrasts in the various DARK VALUES and LIGHT VALUES. The LIGHT VALUE is white the DARK VALUE is black. There are a large assortment of grays in black and white photography. Grays create the many MEDIUM VALUES. 2. Nature arranged in imitation of the classical Still Life painting. Remember to define the term “Still Life” for the class. The definition of Still Life means a close view of an arrangement of natural or manmade objects that an artist paints in a picture. When photography came along, hundreds of years after painting, artistic terms and rules were applied to this medium as well. Almost any object can be included in a Still Life arrangement, as long as it is inanimate (does not move) and small enough to fit on a table. Usually, a Still Life is set indoors and contains at least one manmade object, such as a vase or bowl. Cut flowers are a popular item for this type of arrangement. Other popular objects are fruit, vegetables, vines, baskets, pottery, vases, ceramics, even glassware, books, and cooking utensils. Each of photographer Charles Harry Jones’ fruits, flowers, and vegetables are posed to capture the individuality of its variety. The subjects are not seen in their natural setting of a garden, but an arranged setting in a studio. The photographer has used the sharpest focus and a tight close-up. The subjects are tightly centered to fill most of the picture. The subjects are isolated against a neutral background (contrasting dark or light) so the viewer focuses only on them. Any extra details have purposely been left out. The photographer concentrates our attention on the detail of the subject he has chosen—details that often go unnoticed, although we have all seen most of these subjects thousands of times. This packet is a good chance for kids to practice observation skills. 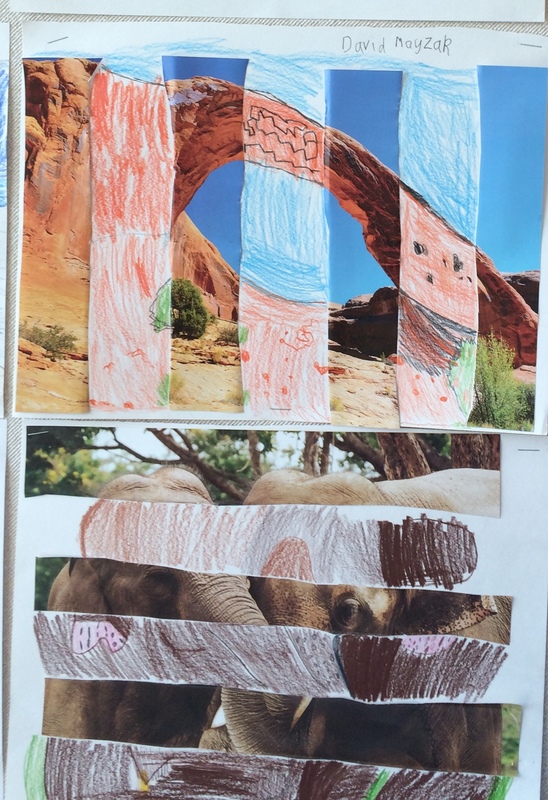 Because they are young and because there are no “extra” details to keep their attention, kids will look at the photographs quickly and will not naturally take the time to notice artistic details such as LINE, SHAPE, TEXTURE, RHYTHM, BALANCE and PATTERN. By pointing these Art Basics out to them, you make sure the kids will never look at an ear of corn or a cantaloupe in the same way again! Charles Harry Jones was born in Wolverhampton, England in 1866. His father was a butcher and Charles grew up to become a trained gardener. Where he received his early education and inspiration is unknown—much about Charles Jones is a mystery. Sometime between 1904 and 1910, Charles Jones, his wife and his children left Ote Hall and moved to Lincolnshire, England. What Charles did from that time until his death, about 50 years later, is mostly unknown. He was a very private person and did not talk much. Although he was an extremely gifted amateur photographer, his talent went mostly unnoticed during his lifetime. By the 1950’s, Jones and his wife were still living in Lincolnshire, with no electricity or running water Charles Jones had grown up before most modern conveniences had been invented and was perfectly content living without them. His children were shocked to find that for many years Charles did not even claim his rightful old age pension. Always a proud man, he considered it charity. Charles died at age 92, on November 15, 1959. There are very few facts known about this man, who lived a very unassuming, yet useful life. He was never famous and never tried to be in the spotlight. However, a surprising discovery, made twenty-two years after he died, brought attention to an artistic gift and talent, which Charles Jones possessed. In 1981, at an antique market in London, a man named Sean Sexton chanced upon a trunk that was for sale. The trunk contained hundreds of photographs. All of the old photographs appeared to be of the same subject—vegetables. Although these pictures had been passed over and ignored by everyone else that day, this man instantly recognized an originality and artistic quality in the photographs. He fortunately bought the entire trunk full of photographs for a very inexpensive price. What Sean Sexton noticed about the photographs was that the person who took them paid great attention to the way he focused the camera, printed the photos and even the detailed notes he had written on the backs. The photographs were gold-toned gelatin silver prints made from glass-plate negatives. Two-thirds of the images were vegetables and the rest were evenly divided between fruits and flowers. Almost all of the photographs were labeled on the back with the exact name of the plant followed by the initials “C. J.”. 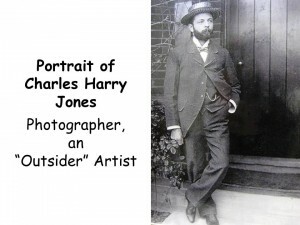 A few of the photographs had the photographer’s full name…Charles Jones. The few facts listed here are just about all that is known about this talented photographer. The main mystery is this—how did it happen than an obscure gardener could produce photographs of such originality and artistic vision? Many other intriguing questions exist about the photographer—where did this gardener find the time to create so many beautiful and original photographs? Where did he get his photographic training? Why had this very talented photographer gone virtually unnoticed throughout his long lifetime? It was also amazing that these original photos were almost thrown away before somebody took the time to look at them long enough to see their real artistic value. 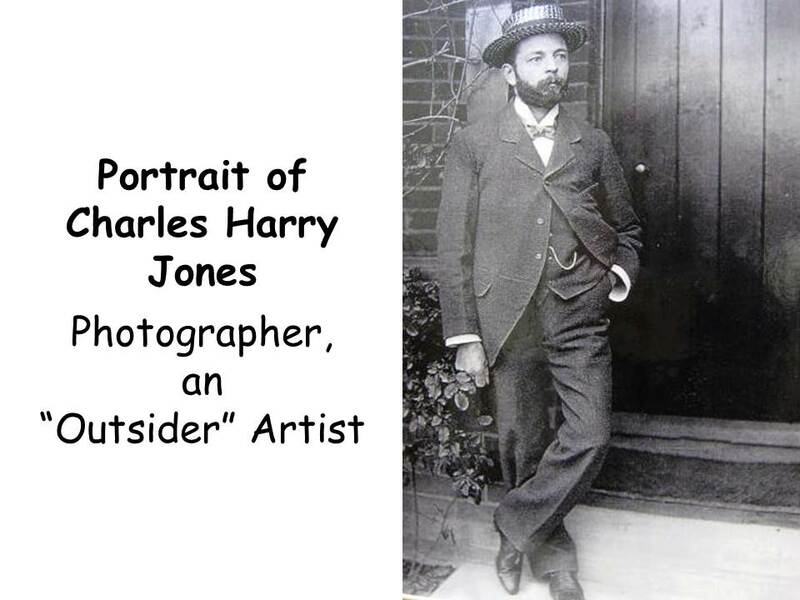 Charles Jones obviously thought of himself as a serious photographer or at least considered his work with enough artistic pride to initial each photograph carefully. Why then didn’t he exhibit his photographs? The only answer seems to be that Charles Jones falls into a category that is now referred to as an “outsider” artist. The “outsider” has energy and determination to create, but through fear of rejection or personal shyness in sharing his achievements with others, refuses to exhibit or even acknowledge to the world the existence of his art. Unfortunately, most outsider art ends us disappearing because nobody even knows that it exists, if the artist isn’t willing to show his talent and skill to other people. It is very lucky that Sean Sexton’s eye helped to recognize and save these originally artistic photographs. It is unknown where or when Charles Jones created his extensive and highly focused body of work. The photographs are not dated, but a Still Life photograph found in a family album and dated 1904, along with the type of photographic materials Charles used, give clues that date the pictures as probably being taken between 1895 to 1910. It is very likely that Jones took the photographs when he was employed as a gardener at Ote Hall. Jones held an important position there and was excellent enough as a gardener for mention in the 1905 magazine article. The fact that The Gardeners’ Chronicle does not mention that Jones was also a photographer of vegetables, fruits and flowers, as well as a gardener, may have been an oversight. It is more likely, though, that Jones considered his photographic work in Still Life a private creative activity and probably never talked about it with the writer of the article. Charles Jones had a respect and reverence for the overwhelming beauty of the fruits of the earth. Jones left no notes, diaries or writings to explain his reasons for the creation of these photographs. The photographs themselves are the only statements the world will ever have from this artist photographer about his art. Since Charles Jones was such a talented photographer, why did nobody know about his photographs before they turned up at a London antique market in 1981? The only answer seems to be that Charles Jones falls into a category now referred to as an “outsider” artist. The “outsider” has energy and determination to create, but through fear of rejection or personal shyness in sharing his achievements with others, refuses to exhibit or even acknowledge to the world the existence of his art. The peas in this picture are still in the pod and still on the vine (see top of the photo). You can also see the leaves. In a black and white photograph, the LIGHT VALUE is white the DARK VALUE is black. Various grays create the many MEDIUM VALUES. How can we tell that it is closest? The two pods behind it have a DARKER VALUE because the pea pod in front shades them. There are white highlights running up each side of this open front pod, where it catches the light. The highlights have the LIGHTEST VALUE. These are the kinds of gourds found around Vancouver in the fall. Many people create table or porch arrangements with them for Halloween or Thanksgiving. Where is the DARKEST VALUE in the photograph? 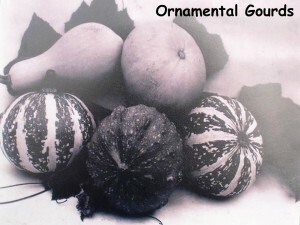 The photographer has placed leaves under and around the gourds. In this photo, the leaves are so dark they seem black. It is hard to tell for sure if these are heads of lettuce or of cabbage. 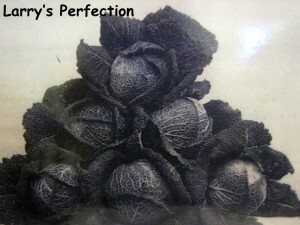 This variety, called “Larry’s Perfection”, has a very interesting TEXTURE and DESIGN. The leaves lying more tightly against the head have interesting white LINES that form PATTERN and TEXTURE. What is a SYMMETRICAL arrangement? Similar or identical objects are placed equal distance from the center. If you folded this photograph in half, one side would be a mirror image of the other. An Iris blooms in the spring and they come in many colors. This iris has more than one color. How did I know this since the photograph is black and white? 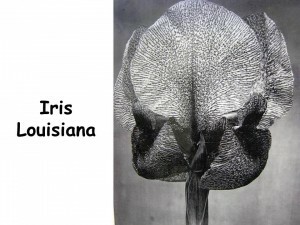 The bottom petals of the Iris have DARK VALUE. The DARK VALUE LINES on the LIGHT VALUE petals create in interesting PATTERN. 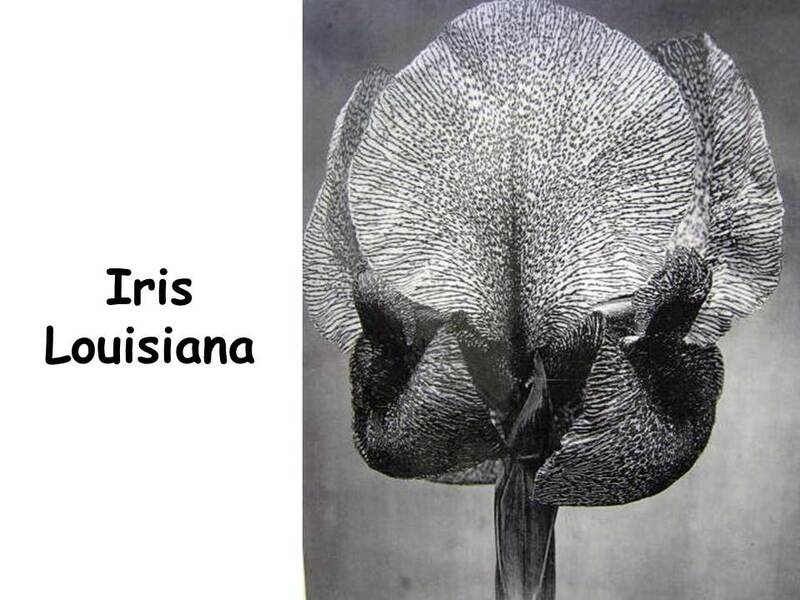 The iris stem is a darker MIDDLE VALUE. The plain BACKGROUND is a MIDDLE VALUE. Dahlias bloom during the summer and come in a variety of colors. What type of BALANCE do these individual flowers (Dahlias) have? Each flower is an example of RADIAL BALANCE or RADIAL SYMMETRY. Radial balance happens when the elements of a design radiate, or move out, from a center point. The round berries filling most of the photograph have the DARKEST VALUE in this photograph. The leaves have MEDIUM VALUE. The BACKGROUND and the highlights of each currant are the LIGHTEST VALUE. Are there any LINES in this photograph? 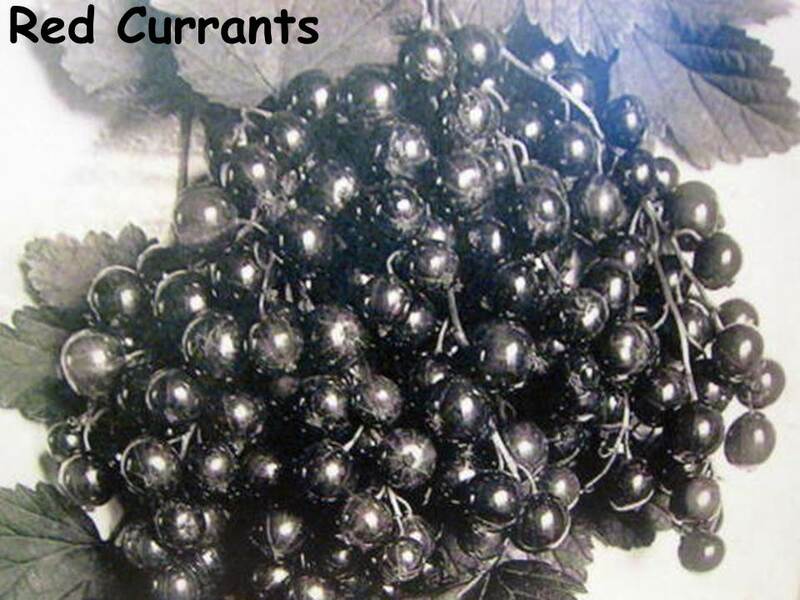 There are stem LINES and, if you look extremely close, the currants have delicate white lines radiating from the bottom to the top. The ruffled leaf edges have CURVED LINE and there is DIAGONAL LINE in the center of each leaf. Of all the photographs, this one is set up more the way a traditional Still Life painting would be. The melon is sitting on a leaf, placed on a white plate. It also seems that we can see the corner of a table on the right. 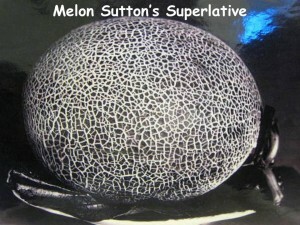 The vine is still attached to the melon, creating LINE. A variety of LINES create PATTERN and TEXTURE on the surface of the melon. Point out the way this melon almost fills the entire picture. 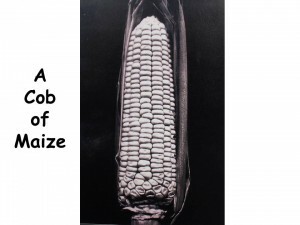 Maize is the Indian name for corn. Corn is usually yellow but can be variegated in COLOR (multicolored). 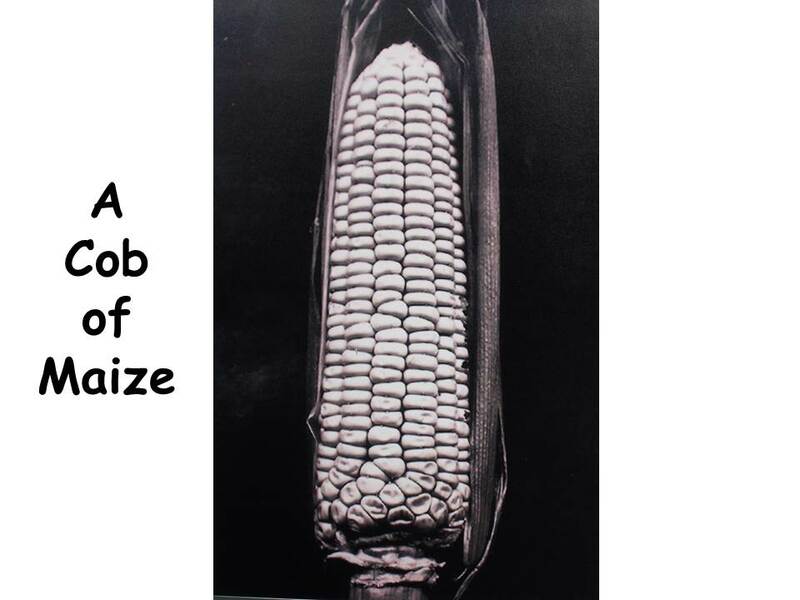 RHYTHM is created in this picture by the REPETITION of the SHAPE of the kernels of corn. The shapes are rhythmically arranged in six vertical LINES that create PATTERN. 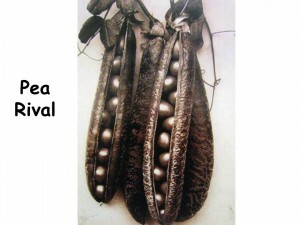 • Many kids believe that peas grow as individual green beads, the way they are found in a can. Sugar peas are easily found in produce departments, in their pods. Bring in a few of them and create a Still Life arrangement. Sketch the pea pod arrangement with charcoal (Grade 4-5, as this medium is messy), or paint them using a black and white VALUE SCALE. • Create a large pea pod with green paper and glue to white paper. Fold a 2” wide strip of paper accordion style, to cut out several peas of the same size at once. Use a hole punch to cut and glue small circle “highlights” on the peas. Be sure to discuss which way the light is shining before beginning so highlights are glued correctly. • Create a cut paper orange using orange and yellow paper. First, cut a large circle from orange. Cut a yellow circle that is ¼” smaller than the orange circle and glue this on top of the orange circle. Then cut orange triangles and arrange them in a RADIAL BALANCE design around the center of the circle to represent the sections of the orange. Make the orange large enough to fill most of the background paper. • If it is fall, create an arrangement of assorted ornamental gourds. Sketch with pencil and paint with realistic colors. Older kids may handle an arrangement of 3-5 gourds but younger ones would be better off with two. • If your school has enough of an Art Discovery budget, kids could photograph a Still Life arrangement. One roll of film should be enough to allow each student to take their own photo. List names in the order that the pictures are taken. This way you can return the photos to the correct photographer, once they are developed. Use a solid color cloth for the table and the background. Make sure the cloth and the subject have sharply contrasting VALUES (i.e. black cloth for lemon, white cloth for black grapes). The background of your photo should not take away from the subject. Place cloth over a small box (taller background) then over the tabletop. Set the fruit, veggies or flowers on the tabletop but be sure they are lower than the box that is creating your BACKGROUND. photography session will move smoothly and quickly. • (K-1) Create colorful Indian corn using construction paper. Trace an elongated oval on yellow paper. Cut a green or tan husk to frame the corncob oval. Use assorted colors of paper, including black, and a hole punch to create the kernels. Create colorful patterns by gluing different colored dots on the cob. • If it is spring, bring in an iris or an arrangement of several irises. • Use a silk sunflower or tulip. These flowers are larger so they will be easier to focus on at close range. • Bring in an assortment of RADIAL BALANCE real or silk flowers (3-4). • Use a bunch of grapes. You could also use darker value and lighter value grapes together for contrast. • Apples come in an assortment of COLOR VALUES—light red, dark red, yellow, or green. Arrange them in a clear glass bowl or set them up in a line. 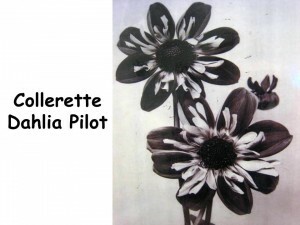 • Print RADIAL BALANCE flowers with tempera paint, using different veggies and fruits as stamps. Cut a head of cabbage in half to create gigantic flowers. Press the cut edge of cabbage in a tray of paint and stamp in the center of a large paper. This will be the center of the flower. The outside petals can be created using a cut potato, orange or apple dipped in paint and stamped around the printed cabbage center (what you use for petals may depend on how much room you have left). For smaller flowers, use things like cut carrots, radishes, celery stalks, and broccoli. Varieties of vegetable stamps are usually more fun! After paint is dry, draw stems and leaves on flowers. 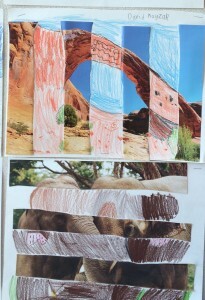 The class gets active with a project like this and it can be messy, but ALL ages will have fun. • A single head of cauliflower, cabbage, or lettuce (any variety) can make an interesting subject for a drawing, painting or a photograph. Broccoli or a bunch of carrots (with leafy tops attached) also. • (Grades 4-5) “Black & White Value Scale” is a complete project by itself. If there are at least two of you, the scale can work nicely to keep the class busy as they wait their turn to photograph. One volunteer should oversee the photography and another volunteer (or more) the painting project. 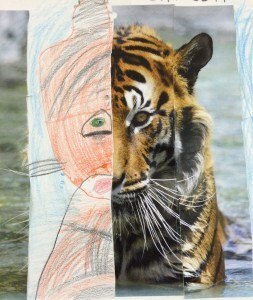 Although it is not a picture, all kids love to paint and this project teaches them as they enjoy painting. smallest puddle possible on their plate, pallet or waxed paper, to have enough paint to finish filling in all boxes. Remember, all kids love to paint, even if it is not a picture of anything! • (Grade 3-5) “Gray Value Scale” can be done using a regular pencil, is less messy and faster. If you do not have at least one extra helper (not counting the teacher), this project is probably the best one for kids to do while waiting their turn to photograph. You could give kids a second Value Scale and have them fill this one in with a single color crayon or colored pencil, to create a Monochromatic Scale also. These two Value Scales should be enough to keep them busy while waiting.